OFFICERS INVOLVED: Police Officers Kyle Kane and Christopher Clune along with Detectives Christopher Brady, Michael Legg and Detective Sergeant Patrick Martin. On March 4th at approximately 3:00 pm police officers responded to a residence within the Twinbrook Apartment complex for a report of a robbery. The caller advised her son was assaulted by a male known to them. The male entered the apartment and stole various items. The male also broke a window in the apartment during this incident. A name and description was provided to the responding officers. 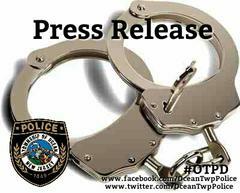 Further investigation by the officers and detectives confirmed the suspect’s identity as Isaiah Gue, 18 years old from Ocean Township. Later that evening Gue was located at the Quick Chek on Route 35 in Eatontown by Detective Sergeant Martin and Detective Brady. Gue was arrested and transported to police headquarters. Gue was charged with the following offenses: Robbery, and Criminal Mischief. Mr. Gue was processed and released on a criminal summons pending his initial court appearance.